Ask a Librarian is a collaborative virtual reference service, offered in English and French, that connects students, faculty members, and researchers from participating university libraries across Ontario with real-time library and research assistance through chat. The service is offered by Scholars Portal, the digital service arm of the Ontario Council of University Libraries (OCUL). Ask a Librarian is available 67 hours per week during the academic year, including on evenings and weekends. Ask a Librarian provides online, on-demand assistance from your library website, allowing users to get immediate help no matter where they are. Our expert staff are trained to provide local, trustworthy answers to library- and research-related questions. 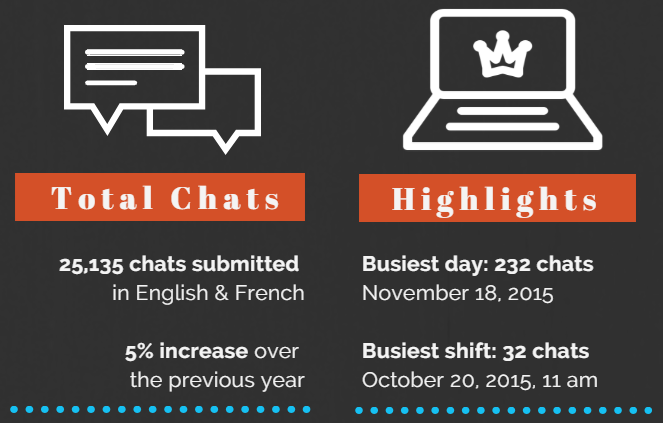 Chat support is available in both English and French during all service hours. Ask a Librarian is powered by Nub Games’ LibraryH3lp, a flexible, scalable chat platform designed for libraries. LibraryH3lp has a simple, user-friendly interface, ample customization options, and a responsive customer support team. The platform has proactive chat functionality and offers unlimited knowledge bases and an optional add-on for text messaging. Scholars Portal offers a comprehensive training program for new chat operators. Sessions include an orientation to the service, hands-on training on the chat platform, a review of best practices for virtual reference and online communication, and an introduction to service policies and procedures. The Ask a Librarian service is coordinated by a designated Scholars Portal librarian, who supports local chat coordinators and manages daily operations, including scheduling, training, communications, assessment, and user support. The coordinator also maintains the chat software, liaises with Nub Games, and hires and supervises student and casual workers who contribute to the service. Participating libraries can track local service usage and operator activity through statistical reports available in the LibraryH3lp admin console. Exit survey results are also available to evaluate user satisfaction and service quality. The Ask a Librarian coordinator can assist with statistical tracking, custom reports, and assessment and evaluation projects. How can libraries join Ask a Librarian? Additional information about Ask a Librarian is available by contacting us. Libraries interested in joining Ask a Librarian are invited to contact ocul@ocul.on.ca. How does Ask a Librarian work? Users enter the chat service through graphic chat buttons or pop-up chat invitations located across their library’s website. Clicking on the chat button or invitation launches a chat window, where the user can enter their question. Ask a Librarian staff answer incoming chats using LibraryH3lp’s chat software and documentation on the Ask wiki space. When the service is closed, questions can be sent to the home library by email, or the user can be routed to a specific webpage. The service is open 67 hours per week, and multiple operators are scheduled for each shift to handle demand. 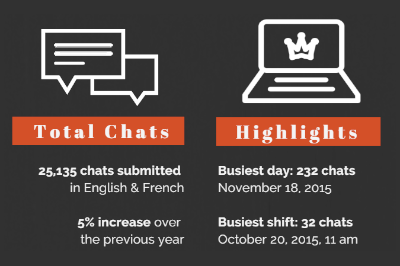 During all hours of service, chat is available in both English and French. Who staffs Ask a Librarian? Ask a Librarian is staffed by librarians and library staff from participating Ontario libraries. During evening and weekend hours, trained students or recent graduates of Masters-level programs in library or information studies also staff the service. What information are users asked to provide? At the beginning of the chat session, Ask a Librarian users are asked to indicate their name and level of study, in order for staff to provide personalized research assistance. Answering these questions is voluntary, and patrons can choose to use the service anonymously. Staff may request the patron’s email address during a chat session in order to follow-up on a research request, but users are not obligated to provide it. OCUL, your university library, and all Ask a Librarian staff respect your privacy. User data can only be accessed by Scholars Portal staff and by designated administrators from participating libraries. Information provided while using the service is collected primarily for statistical reporting to the OCUL board of directors, funding agencies, and your local institution. Data collected through the service may also be used for research purposes, but privacy and anonymity of users will be ensured. Personal information that you provide in order to use Scholars Portal services will be protected in accordance with FIPPA, the Freedom of Information and Protection of Privacy Act. We will not disclose any personal data we collect from you to any party in a manner that would identify you, except to fulfill your service request or where required by law. I would like to use Ask a Librarian data for a research project. How can I get access? This form contacts the Ask a Librarian team at Scholars Portal. To chat with a librarian from your school, please look for the chat button on the library website. 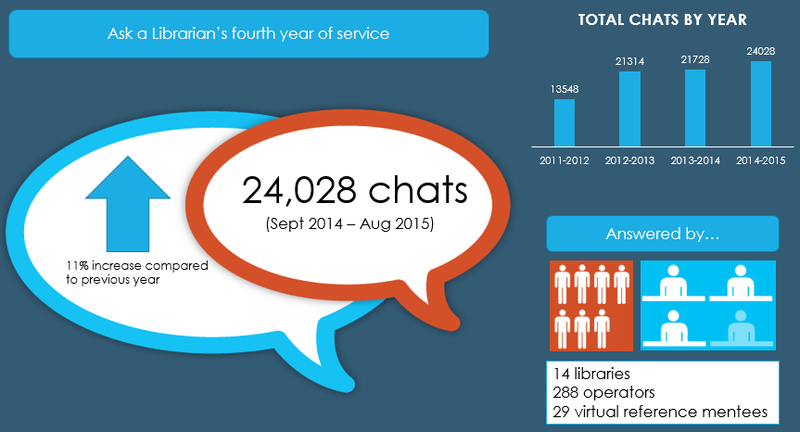 2014-2015 was an important year of growth for the Ask a Librarian service. We launched a French-language partner service, called Clavardez avec nos bibliothécaires, which allowed us to welcome several libraries with bilingual service mandates to Ask a Librarian. 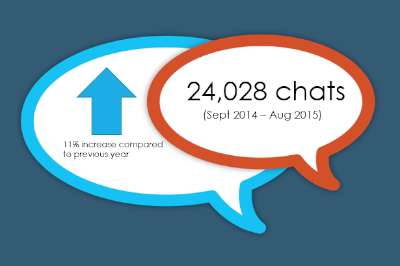 Consequently, we experienced an 11% increase in chat volume during the year (see image above). For a complete review of the service year, including chat volume and user satisfaction statistics, download our “year in review” report. 2015-2016 was the busiest year ever for Ask a Librarian! We set a record for total chats submitted to the service, and we also marked the busiest day and busiest shift in the history of the service (see image above). For a complete summary of the service year, including chat volume statistics and exit survey responses, download our “year in review” report. 2016-2017, Ask a Librarian’s sixth year of service, was a period of transition. 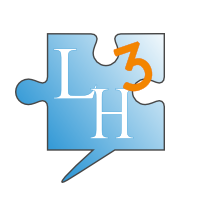 We changed chat software providers and migrated to a new platform, LibraryH3lp, to better meet the needs of our busy consortial service. Throughout these changes, we maintained a high level of service quality, as indicated by users’ positive exit survey responses (see image above). For a complete summary of the service year, including chat volume statistics and user satisfaction rates, download our “year in review” report.